The initiative aims to restore burned ecosystems and target fire-prone invasives like cheatgrass. From the air, Steve Ellis could tell the Soda Fire burned hot. Flying thousands of feet above large swaths of burned sagebrush steppe last Sunday, Ellis, deputy director of the Bureau of Land Management, searched the Idaho landscape for islands of vegetation that might have survived the more than 283,000-acre blaze. He saw none. The conversation in the aircraft quickly turned to landscape rehabilitation. ‘How are we going to seed this? When are we going to get in there?’ Ellis asked his colleagues. 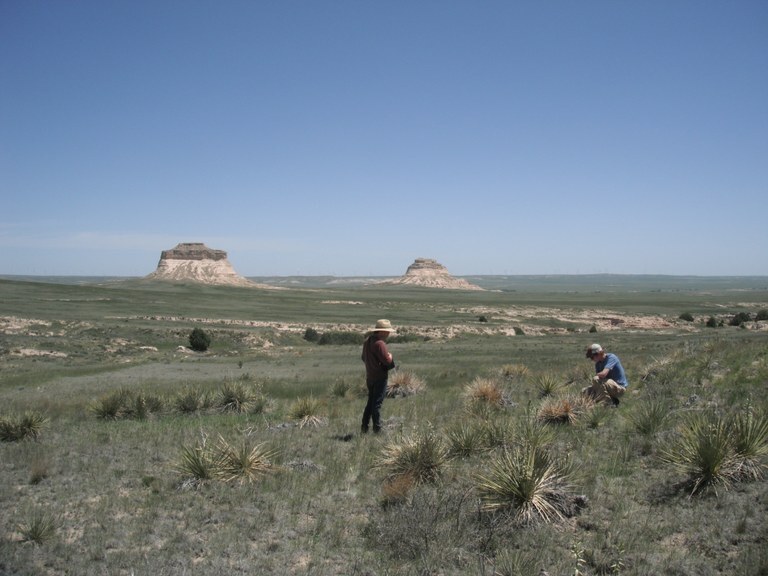 Already, crews have been deployed, hoping to get an early start on planting natives before invasive weeds, like cheatgrass and medusahead, get a foothold. Such post-fire rehabilitation and restoration is an uphill battle for land managers and conservation organizations in the West. Bigger and longer fires make it difficult for crews to take advantage of small planting windows, inflate seed prices and increase demand for personnel and equipment. As a result, many burned areas aren’t replanted, leading to severe post-fire soil erosion. But the federal government is hoping to change that with their new National Seed Strategy for Rehabilitation and Restoration. The strategy, developed as part of the Department of the Interior’s Rangeland Fire Initiative, will guide ecological restoration by creating a national network of facilities to provide storage for genetically appropriate, locally adapted seeds and coordinating seed collectors, farmers and growers to supply such seed. By supporting vegetation types that are resilient to drought, intense fires and invasive species, the strategy hopes to combat the effects of climate change and protect important habitat for species like the greater sage grouse. Today, three seed storage facilities in Idaho and Nevada can accommodate up to two million pounds of seed — a marked increase from the mere 800,000 pounds housed by the original Boise facility five years ago. But Patricia Roller, national seed coordinator for the Bureau of Land Management, says more storage, especially cold storage, is still needed. Each year, the seed warehouses meet with vendors and participate in three to four large seed-buys. In bad burn years, increased demand pushes the cost of seeds up. For example, in 2012, when more than two million acres of sagebrush habitat burned in four Western states, drought-resistant bluebunch wheatgrass seed went from $4 to $5 a pound to $20 per pound. Increased storage, Roller says, would allow the BLM to purchase seed at lower costs when wildfires aren’t raging and store those seeds until they’re needed. The BLM also partners with nurseries to obtain seedlings. Right now, the U.S. Forest Service’s Lucky Peak Nursery outside of Boise is growing three million sagebrush seedlings for the torched West — their largest crop ever. But even three million seedlings may not be enough to restore burned areas in the Great Basin, where fire-prone invasives, like cheatgrass, have outcompeted native vegetation on a massive scale and altered fire regimes. In wet years, cheatgrass flourishes — and this year’s predicted “Super El Niño” could exacerbate the weed’s spread, making wildfires more likely. “In forests, the main thing that drives forest fires is drought and desiccation; but in the Great Basin, it’s the wet conditions that promote fire,” explains Bethany Bradley, a researcher with the University of Massachusetts’ Spatial Ecology Lab. In her spatial analyses, Bradley has found increased fire in the Great Basin after an El Niño year that can be associated with cheatgrass growth.